Russia’s official gold reserves are owned and managed by the Bank of Russia which itself is owned by the Russian Federation. These gold reserves are stored in Bank of Russia vaults in the cities of Moscow and St Petersburg. Russia has pursued a highly accumulative gold buying policy during the last decade with the Bank of Russia’s official gold reserve holdings nearly quadrupling in less than ten years from 400 tonnes in 2007 to over 1500 tonnes in 2016. The Bank of Russia purchases its gold from Russian commercial banks such as VTB Bank, Bank Otkritie, MDM, Sberbank, and Gazprombank which in turn mainly buy their gold via agreements with Russian gold producers. The Russian Gokhran is a government institution which operates the State Fund of Precious Metals and Precious Stones (the Gosfund). This fund can and sometimes does hold gold and can in theory be a supplier of gold to the Bank of Russia. Physical gold is viewed as a highly strategic asset by the Russian government and is classified by the Bank of Russia as a critical reserve asset since physical gold is ring-fenced from international political and legal interference as well as being a safe haven in times of financial crisis. The Russian Federation holds the world’s seventh largest monetary gold reserves of approximately 1600 tonnes, substantially ahead of eighth place Switzerland which holds 1040 tonnes. Russia has achieved this phenomenon by having regularly added substantial quantities of gold to its gold reserves over the last decade. Russia’s gold reserves are owned and managed by the Bank of Russia, Russia’s central bank, and stored in Bank of Russia vaults in Moscow and St Petersburg. The Central Bank of the Russian Federation (Bank of Russia) is a legal entity whose powers derive from the Constitution of the Russian Federation as well as from federal laws. The Bank of Russia is owned by the Russian Federation. The gold reserves of the Russian Federation are owned and managed by the Bank of Russia. Between 2000 and the middle of 2007, the Bank of Russia’s gold reserves remained relatively constant in a narrow range around the 400 tonne mark. However, from the third quarter of 2007, the Bank of Russia initiated a noticeable accumulation of its official gold reserves, a period which coincides with the onset of the the global financial crisis. This gold accumulation trend by Russia has now continued for over a decade. Notable milestones were surpassed in early 2011 when Russian gold reserves exceeded 800 tonnes, at the end of 2014 when they exceeded 1200 tonnes, and by the end of 2015 when they were within a few tonnes of the 1400 tonne mark. The Bank of Russia stores two-thirds of its gold reserves in Moscow in a Bank building on Ulitsa Pravdy (Pravda Street), and the remaining one-third of the gold reserves in a building in the city of St Petersburg. 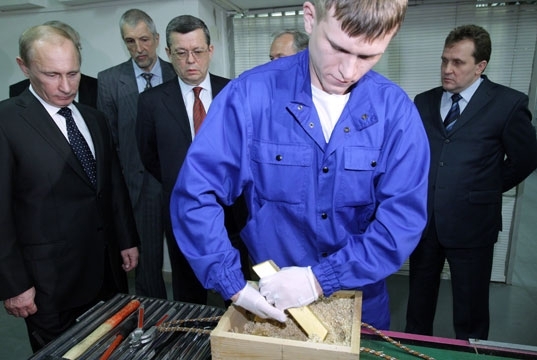 Therefore all Russian official gold reserves are domestically held within the Russian Federation. The Moscow storage vault is known as the Central vault of the Bank of Russia and comprises a space of 17,000 sq/metres, with a storage area of 1,500 sq/metres, and stores both cash and precious metals. The gold stored in this vault is mostly in the form of large variable weight ‘standard gold bars’ which weigh between 10 kgs and 14 kgs (ie Good Delivery bars). The vault also stores some smaller bars (100 grams to 1 kgs bars). The gold bars in the vault are stored in plastic and wooden boxes. In January 2011, the then prime minister Vladimir Putin toured this vault area and was the first Russian prime minister ever to do so. Like all central banks, the Bank of Russia states that it manages its reserve assets so as to optimise the balance of safety, liquidity and return. However, the bank doesn’t elaborate on how, if at all, it manages its gold reserves. At a minimum, the Russian central bank merely keeps purchasing large quantities of physical gold each year and throughout each year. In 2015, the Bank of Russia increased its gold reserves by 203.5 tonnes, to finish 2015 with holdings of 1382.5 tonnes. Between January and October 2016, the Russian central bank purchased an additional 165 tonnes of gold, and made a substantial purchase of 40 tonnes in the month of October, which was the largely single monthly addition to Russia’s gold reserves since 1998. The Bank of Russia communicated during 2016 that it was hoping for a 200 tonne increase in its gold reserves during 2016, which is a number that is probably based on the capacity of the domestic Russian gold mining sector to supply this amount to the Bank as well as to meet other Russian gild market demand. Although it states that there is no target for gold as a percentage of reserves, the Bank of Russia does have an overall target of US$ 500 billion for its total reserves, but does not have a timeline on realising this target of US$ 500 billion, As Bloomberg reported in September 2016. The Russian commercial banks in turn have entered sales agreements with the Russian gold mining companies to purchase their gold output, and under which the banks provide advance payments that to an extent finance the gold producers. Commercial banks require licenses before being able to trade with the central bank however since many of these large Russian banks are government controlled, this isn’t an issue. VTB Group (which owns VTB Bank) and Gazprombank are majority owned by the Russian Government. Sberbank is majority owned by the Bank of Russia. The ‘Gokhran’ is a Russian state organisation that administers the Russian Federation’s “State Fund of Precious Metals and Precious Stones”. This state fund is known as the Gosfund. Given that the Gokhran does not publish any details of the holdings of the Gosfund, it is not clear to what extent the Gosfund holds gold or how much gold it may hold at any given time. However, the Gokhran has been known to make purchases of gold in the past. The international reserves position of the Russian Federation, with a breakdown between foreign exchange, SDRs and gold, is updated each month-end date on the Bank of Russia website. The figures are reported in US Dollars, so the quantity of gold reported each month-end can be calculated using the latest month-end US dollar gold price. “Russia is increasing its gold holdings because gold is a reserve asset that is free from legal and political risks”. “the volume of Russia’s gold and currency reserves provides a reliable foundation for the country’s macroeconomic stability. Therefore, “one-time shocks can be overcome”. “The country’s gold and hard currency reserves, which today, as I said earlier, are the third largest in the world – $450 billion. They are our “safety cushion” and allow us to make things easier during the crisis for millions of people.